It's your turn to tell us what a Stillwater graduate should look like! We're working to develop a Portrait of a Graduate that defines what skills, attributes and experiences our students need for success after high school. This document will serve as a foundation for our next strategic plan. During the conversation you'll have the opportunity to consider what you feel our current education system is lacking and what things you believe our schools can be doing to help prepare our students for their future. On November 21, 2017 Anoka County District Court Judge Daniel O’Fallon dismissed a suit by 834 Voice, Jane Doe, Mary Roe and John Smith alleging conflict of interest and open meeting violations by the Stillwater Area Public School’s board of education. See the judge's order. We appreciate the judge’s thorough and thoughtful consideration of the issues. We recognize this has been a difficult time within our community, and we appreciate the dedication and commitment of all of our residents on both sides of the issue. We hope with this decision we can find a way to move forward together on our common purpose - our kids. 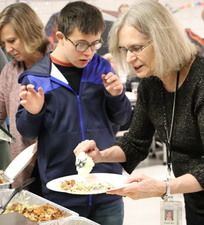 Students at Stillwater Middle School and the 18-21 Transition Program celebrated the holiday season by serving up a meal to classmates and guests. Students in the Transition program, which provides young adults with additional life and work skills up to age 21, cooked up a Thanksgiving meal. Sixth graders at SMS prepared breakfast for classmates and district administrators and staff. Check out more photos from across the district on Facebook. The school board will have a special meeting on Tuesday, Nov. 28 at 5 p.m. at Central Services for the purpose of a closed session for attorney‐client privilege to discuss pending litigation. See the official notice. Our Pony family wishes you all a safe and happy Thanksgiving break.